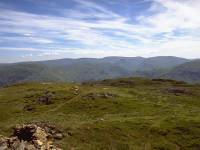 The view southwards from the same point, to Glenridding and Patterdale. The ridge northeastwards drops to a col and then rises again to the more impressive Sheffield Pike, 2232ft. This is the view towards Catstycam and Helvellyn. 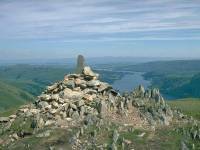 The summit cairn of Sheffield Pike, with Ullswater beyond. The highest tops of the Pennines (Cross Fell, Great Dun Fell and Little Dun Fell) are seen about 40 miles away. The route continues to Green Side, just half a mile short of Stybarrow Dodd, and then turns northwest for Hart Side. This is the view from the summit to the southwest, with the High Street ridge prominent. 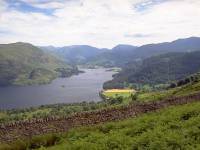 Hart Side (2481ft) is a beautiful grassy top with a long northeast ridge giving an excellent descent to Dockray on the Ullswater shore. 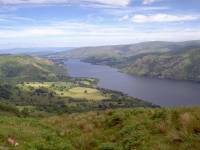 This is the view southwest again, across Glencoyne and the hidden dip of Ullswater. 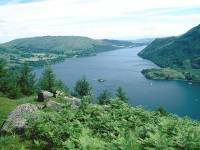 A walk along the ridge to Watermillock Common opens up this view of Ullswater and Glenridding to the south. 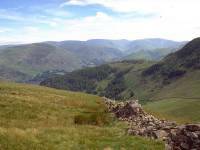 More pastoral country is reached as the ridge falls to Dockray, just north of the Ullswater dogleg. 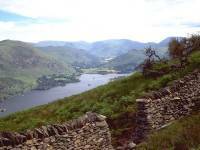 A final view of the southern arm of Ullswater from Common Fell, the last "top" of the Hart Side ridge.